Today's column is one of my favorites. 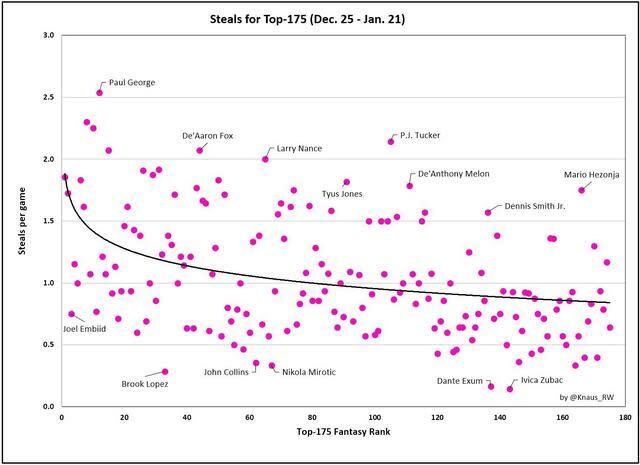 We're discussing the distribution of fantasy statistics across the top-175 fantasy players, showing how quickly stats vanish as we head from elite players (James Harden, Nikola Jokic etc.) to low-end guys (Rodney Hood, Ivica Zubac, etc.). This implicitly involves stat 'scarcity' but even more obvious is the ability to locate specialists. Need a cheap source of steals? De'Anthony Melton and Mario Hezonja have piled them up recently. Trying to move up the standings in 3-pointers for roto? Gerald Green and Reggie Bullock should do the trick. Each statistic is visualized with a chart showing the top-175, from best to worst, with a trendline indicating how quickly that stat drops off. 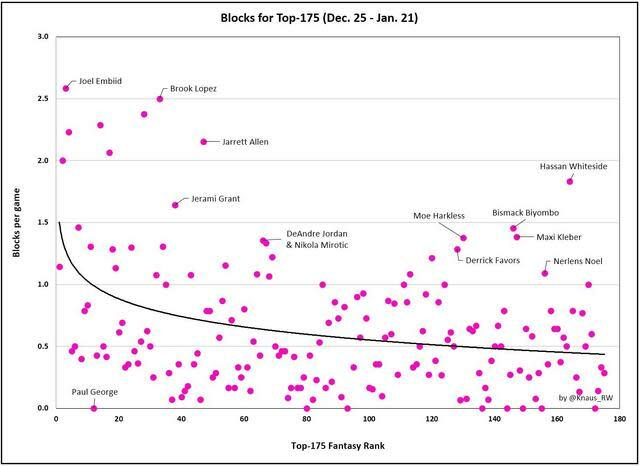 Why top-175? It's a realistic league size, accounting for team rosters and some waiver-wire movement. For players who fall outside the top-175, it means they haven't helped owners in a 12-team league with 14-player rosters. 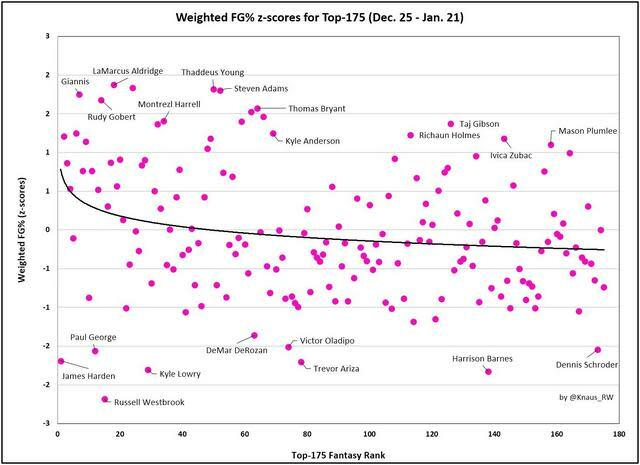 It means that for points-league value (based on the NBA's official system) those players have averaged fewer than Delon Wright's 19.9 fantasy points per game...which is higher than I'd have thought for Delon. This doesn't mean everyone outside 175 is useless, of course. You can hit the lottery with deep-cut players in DFS or by streaming them when they temporarily fill in for an injured teammate. Jahlil Okafor is a perfect current example. Anthony Davis went down 1-2 weeks with his finger injury, and Okafor promptly dropped a 20 & 10 double-double. If you want to roll with him again in DFS (assuming his price doesn't spike too much) or pick him up until Davis gets back (initially 1-2 weeks but could stretch to a month if he does have a fracture), go for it. 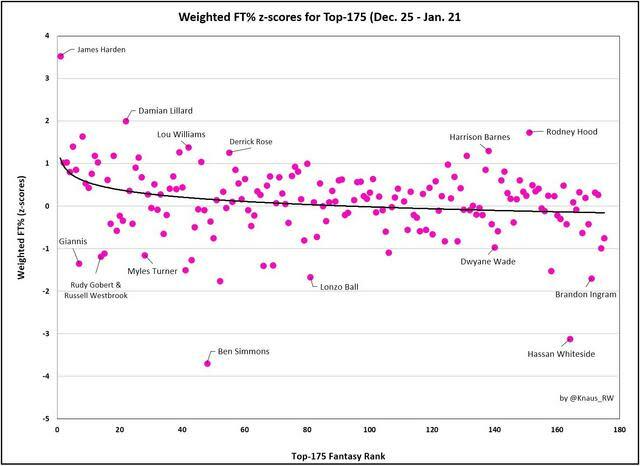 But since Okafor been a non-factor for fantasy owners since Christmas Day, he didn't qualify for top-175. I'm not doing a whole 'top-175' list in this column, but if you want that I'll provide in here on Google Sheets for 8-cat, 9-cat and points-league values. You can view it or download it via the 'File' tab. Nobody will miss players who've averaged under 10 minutes per game, but you may wonder why DeMarcus Cousins, LeBron James, Will Barton and some other notable players aren't included. The answer is that I've eliminated everyone who hasn't played at least five games. These are all small sample sizes, since it's limited to the past month, but I had to draw the line somewhere. Let's now proceed to the heart of the column -- the stat-specific charts! Simply looking at the distribution of players/stats across the top-175 should make clear whether a stat is scarce (typically bunched up among the elite players) or more widely accessible. I've included black trendlines for each category to aid the analysis. Enjoy. James Harden's lead in some categories doesn't even look real. He's single-handedly yanking up the front end of that trendline, which otherwise has a much more gradual slope from 1-175. A simple glance lets you know that points are (as usual) heavily concentrated among elite players. 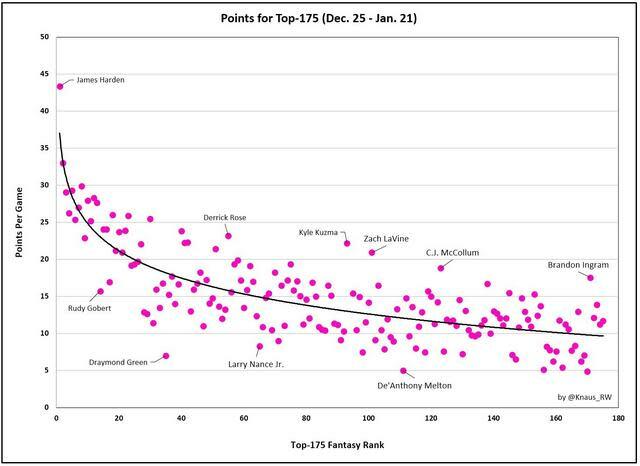 In fact, every single 25+ point scorer can be found within the top-30 for 8-cat value. Late-round specialists include: Dennis Schroder, Reggie Bullock, Bobby Portis, Spencer Dinwiddie, Bryn Forbes, Jaylen Brown, Dwyane Wade...it's tough to find 'specialists' in points, because guys with the ball in their hands a lot tend to be owned. Emmanuel Mudiay, Harrison Barnes and Brandon Ingram all score a lot without offering more than top-125 over the past month, but they're not going to be on the wire in typical leagues. You probably won't find Dinwiddie, Portis or Schroder there either, for that matter. 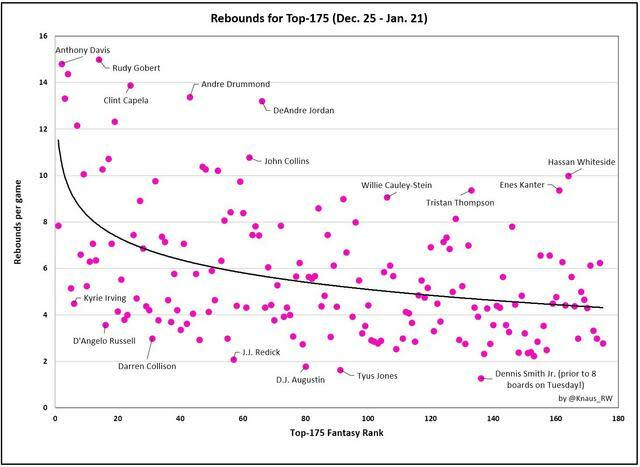 This chart was always going to appear more 'cramped' than most because so many players (mostly big men) don't hit any 3-pointers at all, whereas anyone in the top-175 will at least get some rebounds, assists, etc. Still, it's even more squished to the bottom thanks to Stephen Curry and especially James Harden, whose 6.29 triples per game are simply unbelievable. Meanwhile, Giannis Antetokounmpo has been hitting 0.69 threes since Dec. 25 -- not terrible, all things considered, but the gulf between him and Harden in this category (and weighted FT%) explains why it's hard to envision him overtaking Harden or AD for the No. 1 spot in roto any time soon. That's not a 'hot take' at all, but feel free to argue the point. Late-round specialists include: Gerald Green, Austin Rivers, Malik Beasley, Marco Belinelli, Bryn Forbes, Reggie Bullock, Davis Bertans and more. Players making 1+ triples are a dime a dozen on the waiver wire these days...if you're targeting a specialist you should be getting a healthy 2+ per game. Lauri Markkanen, Marcus Morris and Kelly Oubre were all interesting to me. These are players I own in various leagues, and when I see that they failed to get an assist, or maybe chipped in one or two, I think, "That's fine I guess." But when it happens every single night, the result is a serious drag on their overall value. I was also struck by the fact that three of the top assist-getters since Christmas haven't been traditional guards: Ben Simmons, Draymond Green and Nikola Jokic. I love that. 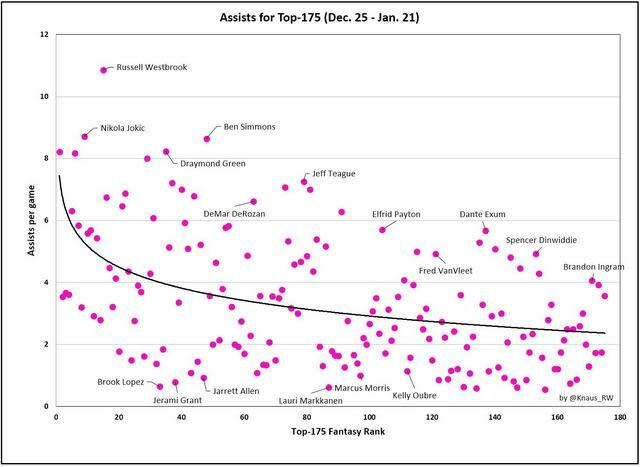 This also reminded me that assists are still a tough category to find on the wire. Even some of the late-round guys like Ingram and Dinwiddie aren't on your waiver wire, despite struggling in 8-cat value recently. Late-round specialists include: Dante Exum (although Rubio's return spoils that)...Dwyane Wade. Not much else. You kind of have to chip away at dimes with guys like Cory Joseph, Jeremy Lin and Shelvin Mack. It's hard to come back from a pronounced assists deficit via the wire. The Thunder have three of the worst high-volume shooters over the past month with Westbrook and PG-13 joined by Dennis Schroder. That makes Steven Adams' elite weighted-FG% production look even more impressive...and important for OKC. I loved to see some players who don't get much credit for recent FG% efficiency -- Thaddeus Young and Kyle Anderson before his injury. I'm all about Anderson as a stash, especially now that Marc Gasol and Mike Conley may be traded. Late-round specialists include: A lot of familiar names like Mason Plumlee, Mahinmi, Zubac, Biyombo and Noel. Derrick Jones Jr. also gets a nod here as a sneaky all-around value with strong FG%, as do Taj Gibson and Richaun Holmes. DJJ is the only non-PF/C in that group, so I'll mention T.J. McConnell as a bonus. He's quietly shooting 57% on more than six attempts per game. Are you lonely all the way down there, Ben? Yikes. 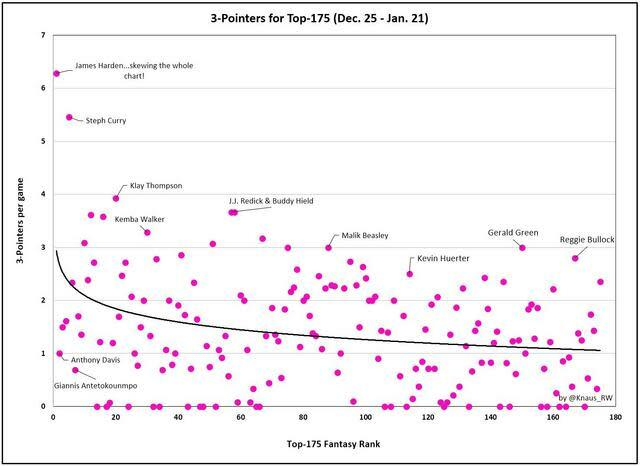 Late-round specialists include: Rodney Hood is about as good as they've been over the past month for specialist value. Wesley Matthews, Jeremy Lin and Bojan Bogdanovic, Jeff Green and even Ivica Zubac have also been quietly helping owners for FT%. Marco Belinelli hangs his hat on 3-point shooting, but he's also been a bonus in this category. That's it for this week's column! If you have any questions or insights, you can always find me on Twitter @Knaus_RW. And don't forget that you can click here to view the past-month top-175 rankings (8-cat, 9-cat and PTS). Good luck this week.